A cool and crisp salad for a great addition to any meal. Fry bacon until evenly brown; crumble and set aside. 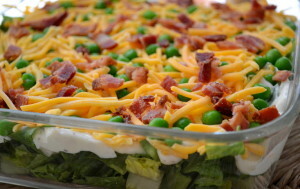 In a large flat bowl, place the chopped lettuce and then layer other ingredients one at a time: onion, peas, shredded cheese, cauliflower and bacon. Prepare the dressing by whisking together the mayonnaise and sugar. If desired, add a splash of milk. Drizzle over the salad and refrigerate until chilled.